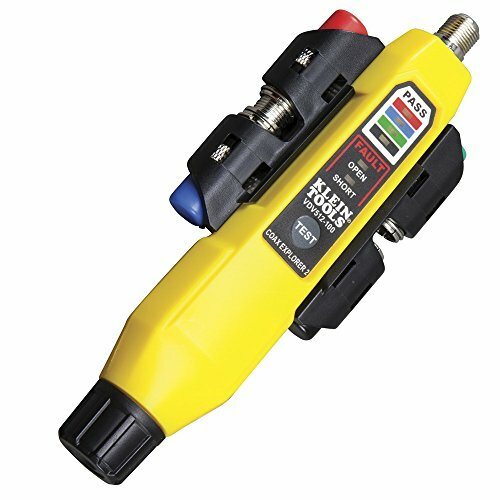 The Klein Tools Coax Explorer 2 verifies proper continuity of F-connector coaxial cables and maps their location. The color-coded remotes allow for up to four cables to be tested and mapped, displaying cable status via LED indicators - PASS, OPEN, or SHORT - that also identify the cable/remote location. Tests coaxial cable and maps up to 4 locations. Simple push button operation. Easy-to-read LED panel indicates PASS, OPEN or SHORT conditions, simplifying cable identification. Color-coded push-on remotes allow for up to four cables to be tested and mapped. The test remotes and F-adapter conveniently snap into the remote holder for storage. the remote holder clips onto the tester. Includes removable, snap-on remote holder, 4 color-coded push-on remotes, F adapter and batteries. Uses 2 AAA batteries. For more than 160 years, Klein Tools has manufactured premium-quality, professional-grade hand tools that deliver the performance, durability and precision needed to get the job done right. Our family of engineers, workers and craftsman continue to put six generations of expertise into every tool we create by using only the highest quality materials, superior workmanship, and keeping manufacturing as close to home as we can. Klein isn't just the name of our company, it's also our family name. And since we're an American company that's family-owned and family-run, you know you can count on us to be here tomorrow. Klein Tools doesn't just make great products, we make great products that stand up to the demands of the professionals who use them every day ... Since 1857.